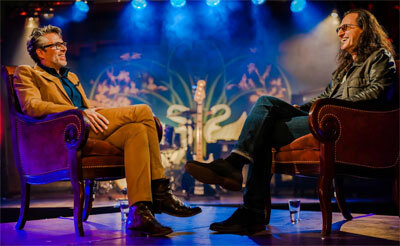 Geddy Lee is interviewed by Michael Chabon on Speakeasy, which aired on January 29th. Old Lyme, Conn., – February 23, 2015 – The last couple of decades have presented an enormous challenge for some of the world’s most accomplished artists and musicians, as their ‘canvases’ and distribution mechanisms have experienced unprecedented change and upheaval. As business models change and consumer preferences evolve, artists continue to seek an unspoiled, clear path through which they can express their uniquely creative visions to the public. Speakeasy, which debuted last month on public television and which features pristine audio from Sennheiser and Neumann, is that show. The Speakeasy production relies on an array of seven Sennheiser MKH 20 microphones to capture the sound of the room within the McKittrick Hotel. Speakeasy is produced by Front and Center Entertainment’s Don Maggi and Denis Gallagher and directed by Pierre and François Lamoureux of FogoLabs. It is new public television interview series that casts Rock ‘n’ Roll Hall of Fame inductees, Grammy Award winners and some of the world’s most iconic musicians in an unrestrained and pure light, delivering the most authentic possible experience to living rooms across North America. Behind the scenes, the program is supported by an uncompromising technical platform consisting of an array of Sennheiser MKH 20 omni-directional microphones and Sennheiser’s renowned G3 wireless system for the recording phase, and a fully equipped 5.1 surround system with Neumann KH 120 nearfield monitors for mixing and post-production. The program is regularly taped in the McKittrick Hotel, originally built in the 1930s as one of Manhattan’s most lavish and luxurious temporary residences. The recent renovation of the landmark building, which is also home of the theatrical production Sleep No More, served to create the ultimate, prohibition period backdrop for each of the interviews, which are stylish, intimate and rich in creativity. “At the end of the day, our job is to stay out of the way of the content and deliver programming in the purest sense,” says Producer David Belafonte. “Staying ‘out of the way’ is a gift that should be left to only the best technical professionals and equipment.” This is one reason he is pleased to be collaborating with Sennheiser, he explains. “Over the years, this is a brand that has always delivered a consistent, qualitative value add for the artist.” His own relationship with Sennheiser began in the 1970’s, helping set up his father’s stage shows. Pierre and François Lamoureux, both music graduates from Montreal’s McGill University who have extensive experience in audio for video, were responsible for creating the ultra-realisitc 5.1 audio experience that has become such an integral component of each Speakeasy production. 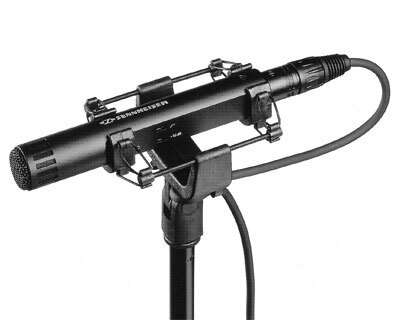 To create such a sonically rich and detailed viewer experience, the pair relied on a combination of wireless lavaliers on the talent, in addition to an array of seven MKH 20 omnidirectional condenser microphones, which were placed around the perimeter of the room in a standard ITU specification to capture every nuance of the audience’s reaction. 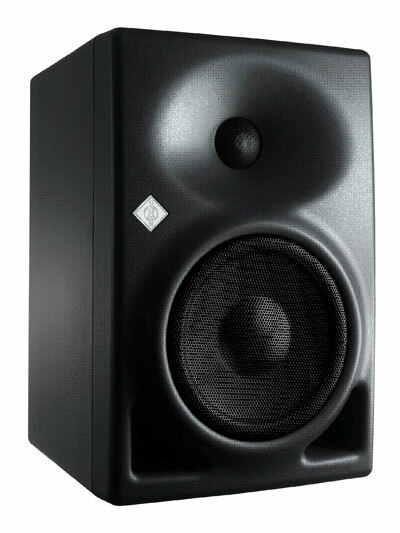 Neumann KH 120 monitors are used during the mix and post-production phase of Speakeasy. Front and Center is the critically-acclaimed concert series that was launched in the Spring of 2012. The original one hour, commercial-free, all-music program airs nationwide on public television. Through the years it has presented an eclectic mix of Grammy winning, multi-platinum selling industry vets and chart toppers, including the likes of Jack Johnson, Keith Urban, Train, The Avett Brothers, Cyndi Lauper, Little Big Town, the Goo Goo Dolls and more. Front and Center is a production of Front and Center Entertainment, LLC in association with WLIW21 for WNET, and distributed by American Public Television.